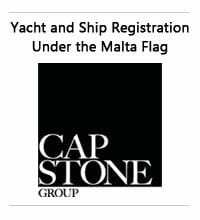 Aicon, the Group headquartered in Messina which operates in the design, construction and sale of boats and luxury motor yachts, announces the signing, with the banks which are creditors of the Aicon Group, of the contractual documentation, for the implementation of the Financial Plan in support to the Restoration Plan 2009-2012. The undersigned agreement with the Banks provides the following: The consolidation and reformulation of short and medium/long term debt, with a 16 months preamortization and refund of the capital in five years following the pre-amortization period; The granting of new financing for a total amount of € 10,1 mln, € 4,5 mln of which are in cash and € 5,6 mln are signature loan in support to the commercial activity of the Group. The maintenance of the existing revolving lines; The granting of new financing for a total amount of € 6 mln by the majority shareholder, already entirely paid in; The commitment from the majority shareholder to cover the losses of the current financial year and the possible losses in the next financial years for the entire duration of the Plan, by waiving, year by year, its credit towards Aicon S.p.A. in safeguard of the net assets, up to the total amount of its credit. The Aicon Group availed itself of the assistance of “Vitale e Associati SpA”, as financial advisor and of Clifford Chance as legal advisor. The banks have been assisted by Norton Rose as legal advisor. The Aicon Group operates in the design, construction and sale of boats and luxury motor yachts. Active in this sector since 1999, in few years the Group has become an extremely dynamic operator on an international level and, at the fiscal year which closed on August 31, 2008, registered income equal to € 68.6 million. The Group has two brands, Aicon and Morgan, whose products can be classified in two different segments, the first, in the Flybridge and Open, the second in that of Dinghy, Lobster Boats and Fast Commuters. The Aicon Group has manufacturing sites in the Tyrrhenian side of the Messina district, where the whole Aicon and Morgan range is built. The Group operates in the Americas market through Aicon Yachts Americas LLC. Azimut Yachts in the UK and Balearics dealer Clipper Marine hosted a champagne reception for Azimut Yachts who were presenting the Azimut 38. The Azimut 38 was on display alongside her larger sister the Azimut 58 at the Royal Lymington Yacht Club on Sunday 8 November. Guests enjoyed a delicious champagne buffet in true Italian style typical of the luxurious Azimut brand. Enrico Chiaussa, Azimut European Sales Manager and Matthew Attree, Director, Clipper Marine was on hand throughout the event to give guests a guided tour of the Azimut 38 conveniently docked on the yacht club pontoon. Attendees also enjoyed a presentation from Azimut 62 Evolution owners Mr and Mrs Walker on their journeys around the Mediterranean and Northern Africa. The Walkers have been documenting their journey in Motor Boat & Yachting Magazine throughout their 3,500 mile trip and provided an informative inside view of the luxury Azimut brand with its renowned excellent customer service standard. This has been one of the best Ft. Lauderdale Boat Shows in years said Skip Braver, President and CEO of Cigarette Racing Team, South Florida's own icon of the powerboat industry. Braver reported good traffic and sales as the company celebrated its 40th anniversary with two new models that reflect the changing boating style of its customer. The International following of the brand has also boosted the company's sales as the overseas dealer network is as strong as its brand recognition. Dealers, customers and media from France, Germany and Italy, as well as from around the US, visited the show and an even bigger international attendance is expected in Miami, February, 2010. The Ft. Lauderdale International Boat Show estimated that attendance was up 1%, though fewer exhibitors took space on the power dock. Cigarette's colorful and muscular display of seven boats ranging in size from the GEICO 38' Caveman boat to the 50' Marauder drove continuous traffic to the sizable booth. The Ferretti Group, one of the world leaders in designing, building and marketing motor yachts encompassing a unique portfolio of some of the most exclusive brands in the nautical world, has signed an agreement to transfer its entire shareholding (corresponding to 60% of share capital) of Pinmar S.L., a Spanish company specialised in the painting of mega yachts. The agreement involves the transfer of the Ferretti Group’s shareholding to Pinmar’s current CEO, Remy Millott, and to part of the Top Management, with the support of new investor and Chairman, Sean Ewing. This operation is part of the strategic plan the Ferretti Group has implemented over the past few months, aimed at focussing on its core business and concentrating more intensely on the production and sale of large and medium-sized yachts. Pinmar S.L. joined the Ferretti Group in 2003, and is based in Palma de Mallorca and Barcelona and has recently opened Pinmar USA in Florida. The company specialises in refinishing the world’s finest superyachts and also fairing and finishing many of the most important new builds, as well as the sale and distribution of paints, varnishes and other maintenance products for yachts. Pinmar also controls Yacht Covering Systems S.L., a company which specialises in the scaffolding and custom covering used for yacht painting and other maintenance. Ferretti Yachts and Pershing, two of the most prestigious brand of the Ferretti Group, enlarge their sales network with the new French dealer Abys Yachting. The company, born in 1997 with the aim to manage cruising motor boats rent, developed their business also to the sales area, becoming a point of reference for sales and charter activities for the luxury yachts in France. With four operation offices in Côte d'Azur, among them Antibes, Fréjus, Saint Raphaël and Monaco (the last one is in exclusive for Pershing), Abys Yachting is a premium channel to represent the Italian excellence of Ferretti Yachts and Pershing, brands of the Ferretti Group. The agreement with Abys Yachting represents a new sales consolidation for the French market, which is a strategic one since ever, with special focus on the Mediterranean area where the nautical culture mix the enjoying the sea" style of Ferretti Yachts and Pershing. Ferretti Yachts and Pershing find in Abys Yachting the exclusivity and reliability values which are the key points for the evaluation of a new dealer all around the world. With a highly skilled professionals' team, Abys Yachting is able to offer high quality and accuracy of the services, with a 360 degrees' attention even to the most demanding Owners. Formula is pleased to announce it has once again been recognized for excellence in customer satisfaction in NMMA’s 2009 Customer Satisfaction Index program. The Marine Industry CSI Awards program honors participating manufacturers that actively measure customer satisfaction and pursue continuous improvement to better serve the customer. 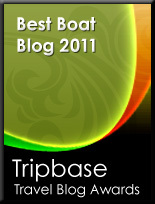 Award recipients have achieved and maintained an independently-measured standard of excellence of 90 percent or higher in customer satisfaction over the past year, based on information provided by customers purchasing a new boat or engine during the period between April 1, 2008 and March 31, 2009. To sail without haste, thoroughly savouring the sea, delighting in each and every moment that makes up life on board, where enjoying the journey prevails over reaching the destination quickly; all of these are aspects which feed the Slow Yachting philosophy, the exclusive Menorquin sailing style. The Balearic shipyard has chosen the expression Slow Yachting to define its own particular form of recreational sailing, in tune with its own very different style of craft. Menorquin is developing its communication strategy for this season around this concept. For the enthusiasts of Menorquin boats experiencing Slow Yachting is nothing new because this way of enjoying sailing is what inspired this company from the very beginning. The genuine values which determine Menorquin’s vision – hand craftsmanship, the quality of its products, the safe sailing qualities and impeccable customer services – are also a reflection of this sailing philosophy. Those who have never experienced sailing on board a Menorquin have yet to discover that Slow Yachting begins the moment the sailor chooses this brand as his vessel for sea life. To experience Slow Yachting implies that each and every circumstance which surrounds the pleasure of sailing occurs in a peaceful manner, for as long as it takes to enjoy each aspect sea life offers: sunbathing on the high seas or in a paradisiacal cove, swimming, diving, fishing… sharing a delicious meal, sampling a fine wine al fresco.., and all of this whilst embarking on a journey of discovery and reaching new surroundings which can only be accessed by boat. Aicon S.p.a., active in the design, construction and sale of boats and luxury motor yachts, listed on the Standard segment of the Italian Stock Exchange, has finalized, through its brand Morgan Yachts, its third Ambassador partnership agreement with Marine Services Varazze for the sale of its classic motor yachts range in the Western Liguria Riviera area. Morgan Yachts is the Aicon Group brand specialized in the design, construction and marketing of Traditional Cruiser and Yachts in the Dinghy, Lobster Boat and Fast Commuter segments. The partnership agreement with one of the main players of the nautical sector in its area confirms Morgan’s commitment to the development of a strong and exclusive network of partners both on a national and international level. Thanks to the experience and the excellent geographical position of Marine Services, Morgan will be able to count on an authentic representative of the brand and its philosophy, in the key area of Western Liguria. Marine Services’ head office is based inside the new Marina of Varazze, a structure which was inaugurated in June 2006, which also has an outdoor area overlooking the central pier for the management of boats and for the organization of exhibitions and events. The offices and the external area will therefore be a meeting point for potential clients and ship-owners who want to be a part of the Morgan world. Marine Services is a new and modern agency for marine services. It is the result of many years of experience in the sailing world. Thanks to its structure, based and organized in the new Marina of Varazze, it offers a wide range of services and activities related to yachting and sailing with a staff of fully qualified professionals knowledgeable in the various fields of the nautical sector. Hundreds of Nordhavn owners along with PAE staff and vendors/suppliers gathered this past weekend to share in a celebration of the one thing that binds them all together: their magnificent Nordhavn yachts. As a rule, if you put two Nordhavn owners in a room to discuss their boats, general giddiness ensues. Multiply that by 100 and change the setting to a picturesque marina by the magnificent Dana Point, California headlands; add three days of beautiful weather, fascinating and inspiring presentations by fellow Nordhavn owners, a little wine, some great music and dancing, and a hiccup-less boat raft-up…well, you get the idea. It was the Nordhavn third Rendezvous ever, and in just over a year. And quite simply, the major focus was on the owners. Not just a rendezvous for the owners, but by the owners as well. A rendezvous in Southern California had not been in the plans for 2009, but at the urging of N43 owner Kurt Antonius, the small, informal gathering had grown into the grandest party yet. It was capped off by special presentations given by some amazing Nordhavn owners who spoke about their bold, incredible journeys, the kind that only Nordhavn owners can talk about from experience. First to speak on Friday night was Ken Williams, as leader of the Great Siberian Sushi Run, who re-counted the months-long trip he and two other Nordhavns took from Seattle to Japan through the same waters made infamous on the Deadliest Catch television show. Ken was followed up by Sprague Theobald and his implausible adventure through the Northwest Passage on his Nordhavn 57. Still reeling from three days quite literally stuck in polar ice, has given him a new, deeper understanding and appreciation for the frozen water to the point that he no longer drinks his beverages with ice cubes. The riveting presentations left the owners buzzing as they returned to their rooms with eager anticipation for the next morning’s day of seminars. But not before more owner appreciation (outlined once again by the efforts of our adventuresome owners) was had in the name of the Distance Pennant awards. Fourteen new distance pennants were awarded at a ceremony hosted by Nordhavn Southwest salesman Jeff Merrill who estimated that the program has so far accounted for nearly 3,000,000 miles traveled by Nordhavns. Saturday morning kicked off with informative seminars such as Safety at Sea demonstrations with Bruce Brown who teaches many safety at sea seminars and represents Switlik, Lugger Engine training with Bob Senter, and a primer on cruising Mexico by Capt. Pat Rains. 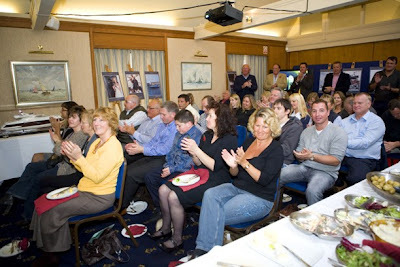 Fresh from the previous night’s inspirational speeches, the crowd eagerly awaited the talk given by their Nordhavn peers, Eric and Christi Grab, who earlier this year completed their first circumnavigation. The interesting thing about the Grabs is that the first leg of their circumnavigation, which took them from San Diego to Nuka Hiva, was essentially their first voyage ever. They led a fascinating discussion on how a couple of novice cruisers managed to take their boat around the world safely, and have fun doing it. Saturday night started off typically enough with a dinner dance and raffle, the proceeds of which went to the neighboring Ocean Institute, a marine education and preservation center. But the owner “love fest” continued when several Nordhavn owners spontaneously grabbing the mic, not in an effort of karaoke as was the case at the first rendezvous in Bristol, Rhode Island, but rather in a profession of thanks and profound gratitude given to the principals and staff of the company. The Heinigers were recognized in their own right, not for any insane cruising miles they had logged after all, they have yet to get on board their Nordhavn but for another accomplishment of sorts. They are the only owners to have attended all three of the Nordhavn rendezvous. The couple, who hails from Missouri, does not live close to the sites of any of the three Nordhavn gatherings. To sum up the weekend, condensed into three days down from the typical five, there were owners from 54 different boats in attendance with 13 boats having actually made the trip. Of these boats were an immense cross-section of Nordhavns from the semi-displacement Nordhavn 35 Coastal Pilot, to the Expedition Yachtfisher, the Motorsailer, and traditional Nordhavn trawlers. The top-notch presentation would not have been achievable without the invaluable assistance of Nordhavn Sponsors vendors. Several of our top level vendor sponsors including Alcom, Lockton Insurance, Palmer Johnson Power Systems, Trade Wind Inflatables, Village Marine, Imtra, Raven Marine and West Marine had product and service display tables set. Nord West announces that the Nord West 370 Sport has been nominated for the European Powerboat of the Year 2010 in the category up to 40ft. 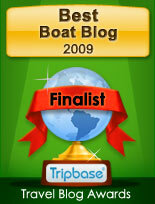 The winner will be announced at the boat show Boot in Düsseldorf in January 2010. At the Stockholm boat show in the beginning of November, Nord West introduced its new brochure including photos of Nord West 370 Sport and SportsTop as well as drawings of new Nord West 430 Sport and SportsTop. Nord West also presented its new video. If you want to have your own copy of the new Nord West video, visit them on one of the coming boat shows, and they will hand you a copy. Alexander Marine, the manufacturer of Ocean Alexander yachts is continuing to grow and expand with the addition of new stores and personnel. In keeping with the aggressive growth and product development plans previously announced, Ocean Alexander is pleased to reveal several promotions within the organization. Joe Ahladis is now the Executive Vice President of Sales, overseeing the entire North American market. Ray Prokorym, based in the Seattle office, is now the Vice President of Sales for Western Region and Oscar Losada, based in the Ft. Lauderdale office, is the new Vice President of Sales for Eastern Region. Oscar Losada became a part of Ocean Alexander’s organization following the completion of the merger between Yacht-Direct and Ocean Alexander of Florida. With this merge, three new office locations are now part of the Ocean Alexander sales network, with offices in Miami, Fl, Panama, and Puerto Rico. There is also expansion on the West coast with the opening of a new sales office in Newport Beach, California. JR Wills has been hired as the senior Yacht Consultant for the new store, located in a prime yachting setting at 2505 West Coast Hwy, #202, Newport Beach, CA 92663. AdmCom won the Grand Prix Brand Identity di Pubblicità Italia, with the Pershing - Moving Idea project. For both the prestigious Italian yacht manufacturing brand belonging to the Ferretti Group and the communication agency, the award is confirmation of the expansion developed during a twenty year working relationship. The Pershing - Moving Idea project kicked off at the end of 2006 and, during the three year period of building the brand coherence, comprised the redesign of the logotype, the coordinated institutional and corporate image and, more generally, use of integrated communications tools. Particular attention was paid to the “This Is More Than" event which, during the 2008 Salone del Mobile, celebrated the launch of the new Pershing 64' along the Naviglio Grande in Milan; to the “Surprising the Future" calendar; and to the initiatives undertaken both on line and within the digital sphere. The award, now in its 18th year, acknowledges the value of strategies, communications coherence, and the brand and coordinated image set down to transmit and consolidate a corporate identity. The Grand Prix Brand Identity awards top brand identity and strategic design projects under the structural profile of visual communication. Simultaneously, it contributes to discovering and promoting new creative talents, providing companies with another instrument for choosing the right agency. The panel of judges was formed of top technicians from the visual communications sector and marketing directors from investing companies. The awards ceremony took place on 26th October at the Executive Lounge in Milan. Maurizio Cinti and Sara Garagnani, CSO and Accounts Director at AdmCom, respectively, collected the award. Exceptional appointment at the marina in Cattolica: Pershing and Stardom met owners during three days of exciting sea trials from 30th October to 1st November, an exclusive appointment with the power, design and innovation of Pershing yachts. At the close of the 5 days of sea trials organised in La Spezia by Ferretti Group within the sphere of the easea>trial event, prestigious Ferretti Group brand Pershing, and its exclusive dealer for Italy, Stardom, proposed another appointment, devoted to both owners and enthusiasts who wish to experience the excitement of a sea trial firsthand. From 30th October to 1st November, some of the models which best represent the Pershing fleet were available daily from 10a.m. through to 5p.m. in the exceptional setting of the marina in Cattolica. Pershing and Stardom offered guests the chance to visit their yachts, and try out the excellent performance of the various models at sea. An impressive six models from the fleet have been placed at guests' disposal, in order to offer a wide ranging, diversified roundup to those wishing to enjoy a unique experience firsthand: Pershing 80', the shipyard's very latest model and winner of the Best Luxury Performance Yacht 2009 award on the Chinese market; the famous Pershing 64' and Pershing 72', symbols of design, functional innovation and high on-board technology; Pershing 50' and Pershing 56', featuring a clearly sporty style without renouncing to elegant interiors, and the extraordinary Pershing 46', which encloses an excellent performance and extraordinary liveability on-board, in just 16 metres. This appointment Pershing and Stardom have devoted to both clients and prospective clients is part of a general strategy aimed at offering increasingly more detailed, comprehensive services. The aim is to satisfy the demands of each and every owner, free to try the yachts they prefer firsthand, choosing the most convenient location and taking advantage of specific dates devoted to this. Lastly, it is worth underlining how this kind of event is of great importance to support the network with which Pershing has always worked, with a strongly synergic approach and an identity of values. Hugely popular with the readers of Swiss magazine Montres Passion l'Hebdo, as well as visitors to its website, the Pershing Asteria watch was awarded the highly coveted title of Watch of the Year 2009 by the public, confirming the Parmigiani brand's burgeoning reputation among the general populace. Created in 2008 to mark the partnership between the highly prestigious Italian yacht manufacturer Pershing and the Parmigiani brand, this collection of ultra-sporty Parmigiani Pershing timepieces takes the ocean as its inspiration, revealing undreamed-of curves while preserving the key elements that characterise the brand: the elegance and classicism which only the expertise of an autonomous watch manufacture can guarantee. Now, having been awarded the Prix du Public, the Pershing Astéria is testament to the sweeping success of this collection, barely a year after its international launch. UK boat builder Princess Yachts International has reported a turnover of £206,62m for the year ending December 31, 2008, up from a turnover of £195.58m for the same period in 2007. Pre-tax profits also rose, from £24.59m in 2007 to £26.58m for the year ending December 2008. In 2008 Princess employed an average of 1,918 in its workforce at its Plymouth facilities, up from an average of 1,738 in 2007 and 1,562 in 2006. In May this year the boat builder announced that it was making 316 workers redundant, including 261 compulsory job losses. The job cuts were less than had been anticipated when Princess announced in March that it would be making cuts. At the time, the company said that up to 450 jobs were likely to go. This month the company announced that 20 workers were to be re-employed. It was another successful boat show for Australia’s largest luxury boat builder, Riviera, boasting sales of a number of models across the brands extensive range. A large floating display covering over 9,000 square feet was home to seven of Riviera’s finest models from across their Flybridge, Sport Yacht and Offshore Express ranges during the five-day event, and again the popular ‘I Love Riv’ team distributed more than 6000 stickers, which were a hit with Riviera’s very loyal US owners. Marking its 50th anniversary, the Fort Lauderdale International Boat Show is the world’s largest boat show extending over three million square feet of space at six locations and showcasing more than US$3 billion worth of boats. Riviera Yachts USA dealer network and distribution director Chris McCafferty said Riviera’s latest models including the 5800 with IPS and 5000 with Zeus Sport Yachts, 43 Open Flybridge and 51 Flybridge both with IPS struck a strong chord with the American market, reporting strong interest and firm sales in these new models as well as current models. Riviera showcased its 41, 45, 47 and 51 Flybridge models, 43 and 48 Offshore Express, and 4700 Sport Yacht at this year’s Fort Lauderdale Boat Show as well as profiling the 70 Enclosed Flybridge, 5800 Sport Yacht and new Motor Yacht Range. On day three of the show, Riviera treated loyal owners to an intimate cocktail party, held on Riviera’s floating display. Riviera is proud to celebrate its 29-year history and is firmly moving forward with innovative designs that are continuing to inspire the boating market. Riviera’s Summer Showcase could be your last chance to secure your dream boat and spend the festive season exploring some of Australia and New Zealand’s unspoiled waterways. In eight locations across Australia and New Zealand, Riviera’s R Marine Network will showcase millions of dollars worth of brand new and pre-loved Riviera’s in selected models from across the Flybridge, Offshore Express and Sport Yacht ranges – but be quick because they won’t last long. All boats on display can be delivered before Christmas, so go on, spoil yourself this festive season; escape the rat-race and enjoy a relaxed Christmas and New Year on board your new five-star waterfront home. What better way to cruise out of 2009 and leave all the woes of the world behind you as you propel forward into 2010 on board your very own luxurious Riviera. This same event ran last year and was a huge success with hundreds of boating enthusiasts from Whangarei in northern New Zealand to Fremantle in Western Australia inspecting both new and pre-loved models. Tipped to be one of Riviera’s largest sales events, the Summer Showcase will be held from November 25 to December 9 inclusively. The elder statesman of long range cruising and loyal Riviera owner, Ian Reynolds has returned from another incredible voyage, a month-long sojourn aboard ‘Investigator V’ in Papua New Guinea. Together with Bill Feutrill and Keith Hanson, who heads up R Marine Coomera, Ian took his Riviera 56 Enclosed Flybridge to PNG and back – a total of 1380 nautical miles (2555kms) for the 2nd annual Louisiades Rally. At 81 years of age, Ian found the trip “a walk in the park”, blessed with good weather, superb company and the delight of discovery in idyllic cruising waters few powerboat owners experience. Ian’s was the first powerboat to take part in the event, organised by EcoSustainAbility with the aim of exploring some of the hundreds of tropical islands and engaging with the local people, their customs and culture. While the 28 other Rally participants initially viewed Investigator V with a degree of derision, this gradually turned to envy for the Riviera’s mod cons – the espresso machine for lattes and the air-conditioning in the sweltering tropical heat. The local people and many of the yachties were grateful for Investigator V’s desalination capacity, since fresh water is in short supply. Ian’s interest in PNG had been piqued during his circumnavigation of Australia in 2008. Next on the agenda for the fit octogenarian is the circumnavigation of Tasmania, the West Coast of which he says is just as wild as anywhere on this planet. Sunseeker International was recently approached by the charity Help for Heroes to assist with their fundraising climb of Mount Kilimanjaro in Africa. The climb was to take place between 23rd and 31st October 2009, and John Sandford-Hart, one of the climbers and a former Territorial Army soldier, was a below-the-knee amputee who had been advised that he would require assistance with the descent of the mountain. He would require a lightweight all-terrain sled which would need to be capable of withstanding a variety of very harsh environments. A small team at Sunseeker International set about designing a custom-made sled for John, calling on their manufacturing expertise and the help and support from key suppliers. Sunseeker & Stuart Jones had valuable experience within the Formula One industry which proved extremely useful. He was able to develop a high-tech sled using Formula One materials with a hybrid carbon fiber and Kevlar pre-impregnated woven mat with a 6mm cardboard nomex core for the chassis. These materials gave very high strength and impact resistance while being reasonably lightweight. Amber Composites, a leading manufacturer of composite materials, provided materials free of charge for the project, and the welding and fabrication company WRES Ltd. designed and fabricated the metal work for the sled. Other companies involved with the project included Drift Covers, who provided bespoke flight bags, as well as Christchurch Ski & Leisure Centre and Milton Keynes Xscape ski center where the sled was tested. The resulting design was used extensively by John during the descent of the Mount Kilimanjaro last month, and performed better than expected in the icy conditions that the climbers experienced on the mountain. At times the sled was used to carry more than one person, and without it John claimed he would not have been able to successfully make the descent. Graham Lodge, Development Manager of Sunseeker International, said well done to all the brave heroes for their outstanding achievement on this climb and again thanks to all of Sunseeker friends who helped put this project together. Jeanneau presents the new 9 Leader slotting between also new for this year 10 and 8 models, into the middle of this newly updated range which takes also the place of the smaller previously branded Prestige series. Designed as all the Leader's by Garroni this new model follows what we have seen on the bigger 10 with a contemporary and innovative design, high performance, on-board comfort and lightness. The sport top also similar to that of the 10 provides the 9 Leader with two alternative configurations soft top or hard top and emphasise comfort with a layout comprising two areas, allowing for the creation of two large living spaces: one on the main deck and the other below. 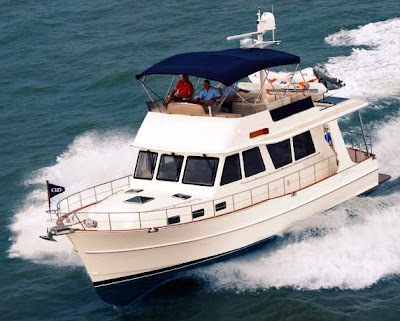 Spaces are abundant in this entry level sport cruiser which offers a C-shaped dinette on the main deck to starboard mostly covered with the hard top, a chaise lounge to port, and double person helm station. Below is accommodation for four in a convertible V-shaped dinette to fore and separate cabin to mid ship. Here is also a galley, and a fully equipped shower head. Power is for a twin petrol standard choice, and single or twin diesel optional. International Shipyards Ancona presented a record breaking six projects in the last period aimed to increase its line up to the current in the water builds of three different models. Five of the new projects are for the slower but with longer autonomy Steel range which already has the 480 and 470 in the water, and one is a much waited addition to the composite line. Four of the projects are all bigger to what ISA has delivered so far, all being over fifty metres in size, with a new flagship at 63 metres also showing in these designs. Pictured above is the project for a new ISA Yachts 630, a three deck superyacht which will be the Italian builders biggest build to date. Designed by Andrea Vallicelli to a concept and naval architecture by ISA's own team, the 630 is a five guest cabin super yacht with owners suite on the main deck. Power is from twin Cat engines which give speeds up to 16 knots, with a cruise of 14 knots giving a range of 2700 nm. The project of the 600 VAL is an alternative design to the 600 WF project presented in 2007. WF standing for the designer initials of Walter Franchini, and Val for Vallicelli, who is behind this new version. Architect Vallicelli presented a 600 with more modern looks and angular curved surfaces. This project also features the master suite on the third deck, with this area being fully dedicated to the owner, and the four guest cabins staying in the lower deck, and a VIP suite on the main deck. Tender stowage is also unusual being located to mid ship in the lower deck, instead of the standard aft area. Twin Cats give a 16 knots top speed, with a 14 knots cruise giving a 2700nm range. Another design as all the new models entrusted to Andea Vallicelli, what is a three deck and a half super yacht which seems to maintain a distinct low profile. The plan of these projects seem also similar to that of the 600 Vallicelli version but in a smaller size, especially to what regards the cabin spaces in the lower deck. Twin Cats give a 16 knots max speed, while 14 knots cruise delivers a 3800nm range. The ISA 500 again follows the pen of Andrea Vallicelli, and is another triple deck super yacht with five owners and guests suite. Crew area with lobby and cabins is located to fore of the lower deck, while a double captains cabin is found on the third deck behind the pilot house. Twin Cats power this fifty metre plus super yacht which weight over four hundred tons at a 16 knots top speed, with a 14 knots cruise allowing for a range of 2200nm. As the smaller ISA 120, the new 140 of the composite line will also be penned by Andrea Vallicelli, the designer who now is behind seven out of ten models by the Italian super yacht builder. Vallicelli presents a similar interpretation to the successful 120, but in a more larger size offering the same low profile sleek sport looks, with two and a half decks. Guest accommodation for the 140 is a four double cabin lower deck, and owners suite on the main deck. Power is a triple MTU engine set up propelled by KaMeWa jet turbines which should reach top speeds of 38 knots, and an all time 32 knots cruise giving a 520nm range. The ISA 390 again to the design of Vallicelli is the smaller offer of the Steel line from the Italian builder. Apart other things this new model is also being available with a new Eco environmentally friendly set up. This version being named Zero is a concept presented by ISA and put in practice with the help of Siemens Spa, and MarQuio BV. A very personal displacement super yacht the 390 offers three guest cabins on the lower deck, and owners suite on the main. Crew accommodation is for six members and a lobby in lower deck to fore, plus a double captains cabin on the third deck behind the pilot house. Power is from twin Cats which give a 15 knots top speed, and a 2900nm range at 13 knots. As all ISA Yachts the 390 is build to meet the strictest class rules. Netherland's Feadship continue to launch bigger Super Yachts in its line, with this new 75.75 m being its second largest build to date, standing only behind the renowned 2004 launched 86 metre Ecstasea. Named Ocean Victory, the 75.75 metre started construction in 2007 at Papendrecht, Feadship dedicated hull building facility. A few months later in Makkum, Feadship also fitted the alloy superstructure. Inside this new big Feadship has a 12 guests accommodation, with crew spaces for 21, in 10 crew, and 1 captain's cabin. Power is trusted to twin Cats of 2682hp each which power the displacement hull up to a 16 knots top speed. This new Magnum 100 model project, presented by this status symbol yacht and cruiser builder will be it's largest size to date, and second in a Super plus eighty foot size. It is expected to be delivered by 2012, with the styling designed by a talented young, Italian designer, Alberto Mancini, who presented echoing lines to the Pininfarina penciled 80 but offers a completely new concept of outdoor cockpit livability. The Magnum 100 has different seating, dining and viewing areas, with an expandable top providing various and movable shaded areas. Technologically designed by Magnum to be eco friendly, with a lot of emphasizes going on weight saving through the use of stronger and lighter materials. The vessel is built in advanced composite foams and carbon fiber, allowing critical HP to weight ratios to be met with lower power, thus saving more than 20% in weight compared to similar models; also making the vessel structure more rigid and more efficient. For less drag and therefore improved fuel consumption, Magnum also installs surface drives one of the first users of this system back in the eighties, which not only reduce consumption but also increase top speed. For slow speed operation, the new Magnum flagship will have an electric harbor drive: an electric wing engine for slow speed operation, which runs virtually silent and smoke free. No noise and no more exhaust fumes. Magnum also designed an interior LED and fluorescent lighting set up which will increase efficiency and decrease interior heat load. Interiors as like any Magnum will be custom designed for her owner and include in standard form a four double cabins, heads, reception and salon areas and of course comfortable crew cabins. Power will be twin Cats or MTU of 2600hp each which should give estimated top speeds of 55 knots. The 100 has been designed to be the most environmentally friendly, comfortable, seaworthy and fast Super Sport Yacht in the world, and with the fame this builder has who can doubt this. Sunseeker launched the 60 Predator at the Southampton boat show, where British largest production powerboat builder presented itself with five new models, three of which super yachts over eighty feet in length, and including with them also the current 130 Predator flagship. The new 60 Predator finds me in a friendly complain with Sunseeker as so far the British builder has always been clever in its history to differentiate its models with names and numbers from previous ones. The 60 Predator is the same name as given to a Sunseeker model from 1999 to 2001. Spaces are key to the new 60 Predator, which also goes back to the basics of the open Mediterranean Sport Yacht outside capturing an attention for big open areas, like the large cockpit which feels that of a much bulkier boat, and a spacious three cabin lower deck. Its main deck is pure entertainment having a sun pad aft under which is a tender garage, two opposite looking L-shaped settees, L-shaped wet bar, and a front row dedicated to the helmsman in his three person settee to port, and two person passenger seats to starboard. Below are the three cabins, galley and C-shaped settee. The owners suite as the big view hull windows suggest is a full beam mid ship affair. The other two cabins are the VIP suite located to fore, and a double singles to port. 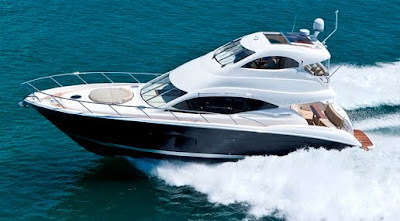 Power is for twin engines up to 1267hp each which should give top speeds of 37 knots. Choice is also a virtue of the 60 Predator with a no hard top open alternative, an option I think we want see much of it around, and propulsion of traditional in line shafts standard or extra cost surface drives. Based on the hull lines of the 46 Wake, Wayachts present the project of the 48 Wake a further development of its first model. The 48 Wake is distinguished from the first presented model of this Italian builder by an integrated carbon hard top covering the central helm station and C-shaped settee, and an aft bathing platform which adds the extra two foot of length from the 46. Apart from these two design accessories which further validate the Wayachts comfort, the 48 Wake offers the same big day boat center console feel of the 46, with its full walk around deck, which makes all the exterior a one place for entertainment. Down below the same twin cabin head interior with galley and saloon as for the 46 is kept. Power choices have not been announced but imagine Volvo IPS500 and IPS600 choices as for the 46. Dutch boat builder Linssen present the new 25.9 Grand Sturdy distinguished by its full hull. This creates a vast amount of space which the designers have put to good use. The separate fore cabin contains a generously proportioned French style double bed and there is also a separate head shower compartments as well as ample cupboard and storage space. The helmsman’s position and cockpit are on one level, creating a “saloon” of about eight metres squared which gives a pleasant feeling of space. It can be completely opened in fine weather and well protected when the weather is not so good (on one side when windy, if desired) using the handy open cockpit covers all around. Helmsman’s position with bench seat and “co-pilot” seat have been located centrally so that captain and partner can together enjoy a panoramic view while under way. The fully equipped galley unit behind the cockpit bench on the starboard side is positioned practically opposite the large, real leather U-bench with great book-reading position and dinette table. The interior is finished in luxury American cherry wood throughout, which creates an atmosphere of warmth and luxury when combined with the curtains and the attractive floor. Although its ease of operation and compact dimensions make it extremely suitable for short weekend trips, Linssen definitely did not develop the Grand Sturdy Sedan 25.9 as a typical day cruiser, on the contrary it is also well suited to longer stays, particularly because of good storage space availability under the cockpit floor. Italian builder Blue Game continue to present new projects based on its concept of what look like large centre consoles, but have much more within and are suited for various uses like cruising, fishing, launch boat, or big tender for a super yacht or a sea side villa. The BG40 is the smallest project so far to come from Blue Game and designer Lou Codega, and company owner Luca Santanella, present a forty footer which represents a similar layout outside and inside to the BG47 but all in smaller spaces. Example of this can be found in the interior which has a similar layout to the bigger sister with two cabins located mid ship, and living area with separate head and C-shaped salon located to the fore part. The cockpit also follows the unique deck layout as seen on the large Blue Game's with full deep wide walk around decks, sun pad aft, and a protected C-shaped settee just behind the helm station. Blue Game has so far presented no options for the outside and inside with only one T-Top version for the exterior fittings, one for the deck, and one for the inside. Codega for the new small Blue Game choose a deeper medium vee of seventeen degrees, versus the twelve of the bigger 47 and 60 models. The novelty for the BG40 is the use of pod drives here the Italian builder choosing ZF Zeus system with Cummins engines. Power is for a standard twin Cummins QSB 380hp or optional 425hp from the same maker. Speed is a max of 32 knots with the standard power, and of 34 knots with the bigger choice. Absolute continue to follow its wave thinking always offering more innovative sport cruisers and yachts. This new 64 from the Italian builder also uses Volvo forward looking IPS pod propulsion, offered on seven out of eight Absolute models. As expected the new 64 has design stints that follow what the 70 flagship presented last year, with only size and spaces making the difference to a similar three cabin, galley below layout. Externally the 64 is also more aggressive looking sport yacht then to the flagship with elegant minimal squarish touches. Taking away the size difference of about a metre and a half in length and one foot at beam, there is not much dividing the two big Absolutes on the lower deck, with all three cabins having there personal en suite heads on the 64, and an L-shaped galley below. You also get a single crew cabin with shower head located at mid ship. The saloon main deck on the 64 is but conservative on layout, offering a C-shaped settee to starboard upon entrance inside and followed by a two person helm station. For the aft deck Absolute also went for a more Mediterranean layout with big sun pad aft, and an integrated L-shaped settee, while to fore for those looking for more privacy in a marina is a five person settee with table. Propulsion continues Absolute use of three or more engine pods, with the Italian builder being the first to experiment with a triple IPS propulsion set up back in 2005 as on its at the time 56 flagship. Just as the bigger 70 the new 64 is powered by quadruple IPS600 D6 435hp, and so far Absolute seems to not offer alternative to this set up, which I am a bit surprised considering Volvo new bigger engine pod series release. Just coming from the launching of its new current flagship the 700 Raptor, Galeon continues to upgrade its range to bigger dimensions with the introduction of the 780 Crystal project. Another eight feet plus in size for the Polish Strazyn builder, and only two feet away of what is often referred to as a pocket super yacht. This expansion to bigger sizes has been impressive for Galeon in the last two years with the 640 Fly launched in 2008, followed by the 700 Raptor for this year. So far Galeon is very tight lipped on details for its future flagship, although we can say that the hull mould is in a near to a completed construction phase. If all goes well I give a maximum of two years for this project to be presented for reality. Watch this spot for more. Ocean Alexander continue to expand its Motoryacht series line by launching the new 68 Pilothouse, which offers a design echoing modernity with a classic touch. Coming from two important novelties in recent times that of launching its important Megayacht Series on the upside scale, and also presenting its entry level Trawler Series explorer yachts range which challenges other famous builders in this new challenging and growing segment. The 68 is a mid range motor yacht which feels like a small ship, and has a semi planning hull which should give medium speeds in the twenty knots region. Inside the 68 Pilothouse Motoryacht layout is a three cabin, with an owner suite located mid ship featuring a separate entrance stair case, and full view circular windows on both sides. A VIP suite is located to fore, and another double guest cabin also with its own bathroom is located to port side. A single crew cabin with single berth is located aft. The saloon is a split level offering an entertaining saloon on the lower level welcoming area, and an open galley, a dining table for six and central located pilot house in the raised area. Worth to note that everything on the 68 feels like coming from bigger sized yachts from the mooring cleats to the feeling large flybridge area which is covered for half of its space by a fiberglass hard top. Power is from twin standard MTU 825hp, up to a more powerful optional choice of 1200hp also by the German engine producer. This sophisticated mechanical device gives the boat owners the opportunity to engage a mechanical rack mover by a shifting cable in case of emergency. This can be for example a complete breakdown of the board electric system including engine, and engine control panel. Finally the Steyr engine will run the boat home on a safety mode. For the time being there is no other electronically controlled marine engine besides a Steyr Diesel on the market which offers this feature. The EDS guarantees the highest safety standard and makes you independent from any other complicated additional propulsion system. This Steyr option has been developed specifically to satisfy the highest requirements of life and rescue boat builders for their SOLAS related products. There is also a high demand and many inquiries from leisure boat builders and blue water sailboat owner who want to offer the maximum safety available on the market. EDS Mechanical Energy Drive System is worldwide unique and available for the whole range of Steyr Marine Diesel 4 and 6 cylinder engines, based on Mono block and High Pressure Unit Injectors fully developed its own engineering department. It is representing the most innovative and professional backup solution for all kind of applications for commercial and leisure boat operation. French Catamaran specialist Fountaine Pajot presents the 40 Summerland, its third power model to go into production. Designed for cruising by Joubert-Nivelt also the designers for the previous two power catamaran models to come from the French builder, the new 40 Summerland offers great comfort in terms of navigation and life on board, featuring open spaces, a sheltered cockpit, and direct safe access areas which make for easy relaxing trips. The flybridge of the 40 Summerland offers a full relaxation area equipped with a sundeck, wide seats and helm station to starboard. Entrance to the interior is through a patio door, here all being flush level with the exterior, making for easy communications with the aft deck outside, and the inside living area. The saloon in the 40 Summerland has well defined areas where you will find the light and comfort of bigger boats, and features a dinette to port which can accommodate six persons, a fully fitted galley opposite to starboard, and the central located main lower helm station. Privacy is a key element for the lower deck of the new medium sized power catamaran Fountaine Pajot. The owners suite located to starboard has a fully independent entrance with its double berth positioned to the beam, a beauty desk, and a private shower head. To port side are two separate guest cabins which share a shower head located in between. The two cabins are a twin single to fore, and a double VIP to mid ship. 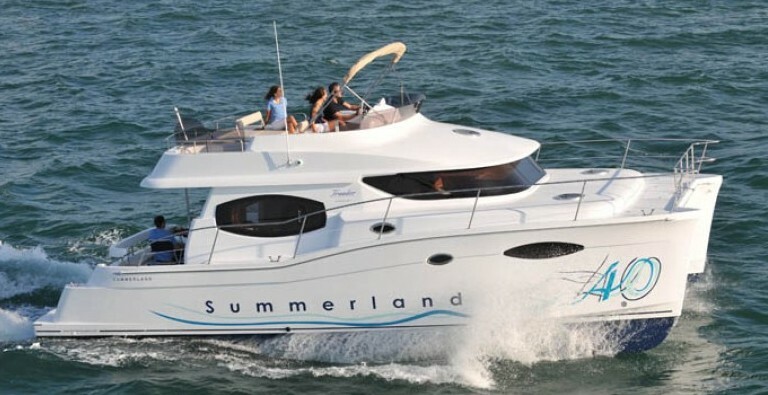 Standard power for the 40 Summerland is twin Volvo D3 150hp engines, with a higher rated D6 260hp available as optionals. The standard engines give a top speed of 18 knots and a cruise of 13 knots. Fountaine Pajot has also some super numbers for its new medium sized Power Catamaran, which at its best economic 7 knots cruise consumes only 10.6 litres per hour and totals 1000 nautical miles on a tank. Following its introduction in the Azimut Benetti Group Yachting Gala in June 2008, the 50x4 from the Atlantis brand is now offered with further options and improvements to the inside for the interior, and for its power choices that is the heart of this versatile sport yacht. Atlantis proposes now the 50x4 with a new restyling of the area below decks, which concerns the decor offering more classic taste, and higher quality materials. The 50x4 has also been upgraded with new engine options, now offered with an optional twin Cat C9 575hp choice propelled with aft looking ZF Zeus pods, adding a more powerful choice to the standard unit of the twin Volvo's IPS600 D6 435hp set up. Performance with this new optional set up is a 36 knots top speed, that is 6 knots more to the standard IPS set up. For the fall of this year French builder Beneteau decided to change the Antares range with all models over nine meters having there designation change in feet size. For the 30 Antares the French builder decided for a full replacement to the nine series, upgrading and renovating it to a new model. The 30 Antares is an innovative motor cruiser, challenging a size and style of the market, that of an entry level flybridge abandoned today by most European motor boat builders. 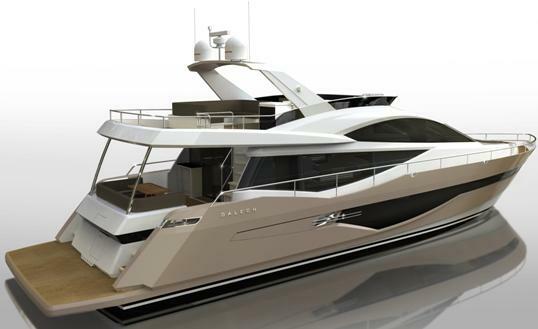 Designed by Sarazin the new small Antares has modern looks to it with an extended flybridge covering the cockpit and an elegant looking windshield. The new small Antares is also about options giving choice to the buyer of a second central helm station up top with L-shaped settee, or replaced by a fully dedicated entertainment area, with sun pad and settee table. A further S hardtop version with patio door is also in the works, and should be launched before the end of the year. 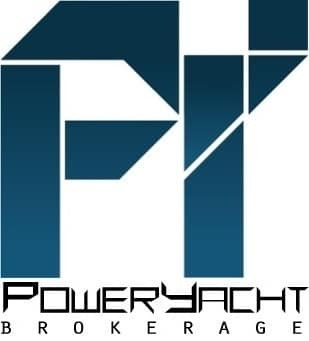 Watch PowerYachtBlog for more information on this project. Inside the 30 Antares is also a comfortable cruiser offering four berths in two cabins plus a convertible extra double bed. The main deck welcomes you in the comfort zone with the C-shaped settee which converts to an additional double berth, galley, and lower main helm station. Below is dedicated to the sleeping quarters with the owners cabin to fore featuring a queen size berth, double bunk guest cabin, and a shower head. Power is by a single Yanmar 380hp, the French Group in recent times taking this more economic choice for its smaller models. After launching the record breaking triple decked 43 Nadara, Tecnomar continue 2009 by presenting big fiberglass super builds, and follows its current flagship with a slightly smaller 41 Nadara RPH. This new Tecnomar is a two deck and a half flybridge super yacht with a raised pilot house. This solution gives the benefit of having a fully dedicated main deck for the owners conveniences. The owner of hull number one of the 41 Nadara opted for the main deck to be dedicated fully to entertainment with a large saloon featuring two large sofas upon entrance, a separate galley, and a dining area to fore. Below is reserved for the five guest cabins, with the full beam owners suite first to present itself after the descending of the stairs. The other four cabins, are located further aft, being the two VIP suites, and two double single berths. Crew area is located to fore with four cabins for seven, three shower heads, and a lobby. Performance is a 28 knots top speed with twin MTU 2880hp, but a bigger engine choice of 3200hp is available which gives a higher 30 knots at wide open throttle. Fazza completed the double by claiming their fifth win of the season in race 1 of the Class 1 Abu Dhabi Grand Prix, after qualifying in Pole Position earlier in the day. Team-mates Victory 1 finished in second place ahead of Sea Dubai-C.A.M. giving Class 1 debutant Ahmed Al Hameli and Giovanni Carpitella their first Class 1 podiums. Leading from start-to-finish, Fazza blew away their rivals to finish more than 25 seconds ahead of Victory 1. The win see’s Fazza move ahead of their team-mates by just one point in the World Championship standings. Despite an impressive start for Victory 1, moving up from fourth to second by the first turn, they were unable to match the blistering pace of Fazza, but claimed their sixth podium of the season, finishing second. Class 1 debutant Al Hameli and Carpitella, Sea Dubai-C.A.M., claimed an outstanding third place. Making the most of the rough conditions on the start run, they reached the first mark alongside the leaders. They fell behind Maritimo after both had run their initial long-laps but moved back into third when Maritimo stopped on lap 5. On the last four laps they had to withstand a determined charge from Welmax, who were closing the gap with each lap, to claim a thoroughly deserved podium place. A supercharger failure ended Maritimo 11 race early, having just moved up into third place. The stoppage frustrated the pair as this was the second race in a row that an engine problem forced them to retire when running in a podium position. Welmax put a slow start behind them to take fourth place, less than three seconds off the podium and see’s them move into third place in the World Championship standings. The performance was the all the more impressive by the all-Norwegian crew after a miscommunication had seen them run three long-laps, as opposed to the mandatory two. A wretched race for Giorgioffshore, after qualifying in an impressive third place, saw them finish fifth. A trim problem on the start run in the rough water outside the island prevented them from staying with the leaders at the start and then a fuel pump problem prevented them from hitting top speed, losing up to five seconds a lap. Foresti & Suardi – Roscioli Hotels came in sixth place to maintain the consistency of finishing all races this season in the points and maintain their fifth place in the championship. There was also frustration for Victory 7 when a fuel problem ended their race on lap nine when running in third place. Fazza completed the hat-trick by winning race 2 of the Abu Dhabi Grand Prix, to add to their Pole Position and race wins yesterday. Their sixth win of the season came after a frenetic start which saw all boats except Maritimo handed a penalty long-lap for jumping the start. For the third race in succession Victory 1 had to settle for second place behind their team-mates, after a tight battle with Welmax who finished third. Fazza Bin Hendi and Al Zafeen, who have now won seven out of nine races since being paired together at the beginning of the 2008 season, did not have the race all their own way and a coming together on the start run with Victory 1 could have ended their race before it had started. Despite this collision they turned the first corner in the lead and then were able to use their superior speed to pull away, completing the 15 lap course in 41mins 47.60secs, to take the win and extend their World Championship lead to eight points. Victory 1, who started the weekend at the top of the World Championship standings, just could not live with the pace of the race winners. After the impact with Fazza they found themselves in third place and behind Victory 7 at the first mark. But Victory 7’s gearing problems on the final corner of the first lap, allowed them to pass them, but they were unable to make any impression on Fazza, and had to settle for second place. A sensational corner at the end of the first lap saw Welmax move up from fifth place to third, overtaking Victory 7 and Sea Dubai-C.A.M in the process. A dramatic hook on the very same corner, a lap later, could have prematurely ended the race for the all-Norwegian pairing, but an exceptional piece of driving by Selmer, prevented that disaster. Having had a frustrating day yesterday the Norwegians were determined to push for second place, setting the fastest two laps of the afternoon, but after feeling a vibration during lap 11 throttleman Tandberg backed off to ensure that they completed the race and claimed a comfortable third place, finishing nearly 34 seconds ahead of Sea Dubai-C.A.M. A fantastic start for Victory 7 saw them turn the first corner in second place, but the brilliant start came at a cost as they were forced to retire after only one lap due to gearing problems. Giorgioffshore were also forced into an early retirement, when their transmission failed on lap three. Maritimo will be keen to put this weekend behind too, after another supercharger failure saw them limp around the course on one engine for four laps, before they finally called it a day. A radio mix-up saw Sea Dubai-C.A.M. take five long-laps as opposed to the mandatory three and one penalty long-lap. In spite of this they were still able to claim a commendable fourth place, making it a fine weekend for the new pairing, who took their maiden podiums in Friday’s race, and move up from eighth to sixth place in the World Championship standings. Foresti & Suardi – Roscioli Hotels maintained their fifth place in the World Championship standings on 53 points, by claiming fifth place. After the confusion at the start, they found themselves briefly challenging front runners, but lost out as they got caught up in their wake. The Championship now heads to Dubai for the season finale, 10-12 December, and with both Fazza and Victory 1 in unassailable points positions, the Victory Team has already secured a remarkable ninth Class 1 World title. Sunseeker launched the new 80 Yacht at the Southampton show. Presented as the entry level for the Yacht range, the new 80 also replaces the 82 in this nine model range, which carries up to the soon to come 46 Metre Yacht, the future flagship of the renowned British builder currently under construction at Poole. Also latest model to carry the illustrious Yacht title, the 80 is a pocket size super yacht just in the border to get this title and being large enough for big luxury and small enough to helm and maintain with minimum crew. The 80 Yacht offers below deck sleep accommodation arrangements allowing for three double full beam suites, or two double guest cabins and two twin guest cabins with crew accommodation for three aft. Power is by twin 1800hp diesel engines, which give 30 knots max at wide open throttle, a cruise of 26 knots, and an economic speed of 22 knots, which allows a range of about 350 nautical miles. Other notable features of the new 80 Yacht are its large flybridge providing separate helm position, ample seating, sunbathing space and the large aft submersible bathing platform providing space to carry a personal water craft, Sunseeker being one of the first builders to offer this solution on its yachts. Just a few months away from the spectacular launching of Clarena 2, a 72 metre super yacht, CRN celebrates a new baptism at sea. “Eviva”, a magnificent 43 metre super yacht, fifth hull of the successful composite CRN 43 line, has touched the sea just a few days ago. The shipyard dedicated this event to its client, who came with his family and closest friends for a moment of special pride at all levels. In fact, the shipowner toasted to this occasion together with the workers involved in the construction of the vessel, testifying a relationship of trust and cohesion. The emotions and joy shared during the ceremony culminated with the impressive slipway launch. “Eviva”, realized with the collaboration of Zuccon International Project who took care of the external and internal layouts, stands out for its significant volumes and the wide-open areas, such as the covered cockpits of the main deck and the upper deck, which turn into a magnificent white hull. Comfort is the password on this boat which can host ten special guests in five cabins and nine crew members, and sail at a maximum speed of 15.5 knots and a cruising speed of 13 knots. Equipped with four decks and a bulbous bow, 43 number five was entirely built at the Dorian premises starting from the realization of prints and the lamination of the hull up to phase of defining furnishings and decorations. Therefore, the entire productive process is controlled for quality and reliability, both characteristics of CRN, testifying the great expertise of the local workers. These are skills that the Ancona yacht builder flexibly uses even for composite hulls to customize and improve them at the owners request. In fact this CRN 43 hull number five features structural modifications on the sun deck, which has been elongated at the stern to make space for a helipad, which has been installed for the first time on a 43 metre. On the same sun deck, upon client’s request, there will also be a six metre sailing boat which together with two jet skis will form the super yacht personal water crafts. The owner and his guests will be able to enjoy the comfort of the internal areas, including the possibility to use the fitness area with a gym overlooking the beach of the lower deck and a sauna for relaxation time. Moreover, one of the other improved peculiar characteristics of this super yacht is the owners suite terrace, a balcony with table and chairs for breakfast which is a distinctive element of the entire CRN fleet. Maritimo present the A50 Aegean Enclosed prior to the standard version. The luxurious enclosed flybridge on the A50 Aegean takes the joy of cruising to new heights, but as well offers uninhibited views of the seascape, and providing also another entertainment area where guests can relax both indoors and out, thanks to the sliding glass doors to an aft balcony. With the helm station up top the A50 Aegean Enclosed get also more room to move on the main deck. Apart from being long on features, the A50 Aegean Enclosed continues Maritimo philosophy on genuine long medium range cruising capability. Designed with an advanced variable dead rise hull which is used on all the Aegean and Sports Cabriolet series, engines and fuel tanks over the centre of buoyancy, and a minuscule shaft angle of just 9 degrees, the A50 has effortless poise and balance, with good 24 knots fuel efficient speed. Named after the Aegean Sea, the A50 Enclosed offers a three double cabin accommodation plan, with owner suite to fore, a mid ship VIP to port side, and double bunk guest cabin. The A50 Aegean Enclosed as its bigger sisters also has tender stowage in a garage aft, being one of the smallest flybridge motor yachts with such a solution. Cornelius Nathaniel Ray III, who founded Sea Ray Boats in 1959, died on November 12 after a prolonged battle with cancer. He was 84 years old. Ray opened the first Sea Ray boat factory in Oxford, Michigan, in 1959. He grew the company into an icon, leading it through the industry's peaks and valleys, including the inflationary periods and oil embargoes of the 1970s. He sold it to Brunswick in 1986 for US$350m. The book, Commanding the Waterways: The Story of Sea Ray, describes how Ray was one of the early adopters of fiberglass, and instilled a culture of innovation into what has become the world's largest production boat builder. Sea Ray now builds boats from 17 to 60 feet. Besides building boats, Ray's other passion was racehorses. He began his first thoroughbred operation in 1983 after acquiring Evergreen Farm in Paris, Kentucky. He won his first stakes race in 1985 and other stakes winners soon followed. Ray was also a frequent participant in the Breeders' Cup program, and won the Breeders' Cup Sprint (G1) in 1996 and 1997. Ray is survived by five sons, a daughter, and his wife Carol. There will be a remembrance ceremony at the St Francis Yacht Club in San Francisco, California, on Saturday. After presenting the 27 Open in mid Summer Patrone Moreno updates this series with the more family orientated closed pilot house type Convertible model. The 27 Convertible is the second new model from the Italian Liguria region builder for this year, and is based on identical water line and hull as the previous Open version. Convertible here means a cruising boat with fishing capability, which is far from the American Sportfisher type but true to its Traditional Liguria Gozzo lines. Gozzo being the traditional displacement type Italian fishing boat since ages gone by. As expected inside the 27 Convertible offers more accommodation to the open version, having an interior divided between main, and lower deck, with an owners cabin to fore, separate shower head, a dining settee and galley. Outside while smaller to its more spartan sister is just as comfortable considering the eight metres of length and offers a sun lounger on the fore deck, and an aft cockpit with a bench seat for four ideally suited for a variety of uses from dining to fishing. The 27 Convertible has the same power as the Open version with twin Diesel engines up to 225hp, propelled to reliable traditional direct in line shafts. Grand Banks launched the 41 Heritage EU in 2008 after presenting the project a year earlier in 2007. While looking on the outside as a real Grand Banks Heritage with similar distinctive trawler like lines still echoing the 1962 built Spray which was the fore runner of the 36 launched in 1964, the new 41 Heritage EU was a challenge of innovation from its builders by being the first explorer cruiser to be powered by pods. A follower of traditional in line shaft drives since the founding of the company in 1956 the change of new propulsion units to one of its boats was taken with huge surprise and enthusiasm by the brand aficionados, and the press. Out of the two available units so far in the market Grand Banks choice went to the ZF Zeus aft looking dual propeller pods. The benefits of the two so far presented pods are known to everyone since 2006, but in case you missed a beat in the last years will repeat them: better efficiency, easier handling, and more speed. If you are looking at a Grand Banks I am sure your interest is greatly revolved around efficiency at a comfortable cruising speed, and it is also this improvement the main reason behind the US Asian boat builder pod transition. As good as it looks the 41 Heritage EU offers real Grand Banks live aboard space in its main deck, a large flybridge, and a twin cabin lower deck. The open aft deck space typical of the EU for Europe models, ideally suited for stern too mooring, welcomes you on board the 41. Here a central patio door takes you inside the flushed decked interior saloon welcoming you with an L-shaped settee to port, a three person bench sofa opposite, large size comfortable galley, and lower main helm station to port. The bench sofa can be changed with two movable chairs as in the optional layout for the main deck. A central stair case leads from the living to the below accommodation deck featuring two spacious cabins, and a large head. The owners cabin with double queen sized berth is located to fore. Guest second cabin with two single berths, which can transform to a double becoming a VIP is located to starboard mid ship. The shower head room which is quite large takes as much space as that of a small cabin, and features a very spacious shower room separated by a sliding door from the head and sink. Below is also space for a big storage room located to mid ship before the cabins, with a hatch entrance located on the main deck saloon. The storage room of the 41 Heritage EU has the space if you want of a cabin and here is also the two fuel tanks located to both sides, and the water tank which stands by the aft looking bulk head. Many think of Grand Banks as slow boats, but the real fact of the matter is that the traditional trawler looking explorer cruisers and yachts have always had a hybrid designed semi displacement planning hull with keel capable of twenty plus knots, which for the 41 Heritage EU also has a medium vee seventeen degrees dead rise aft, and deep twenty two at midships. This hull while reminiscent of trawler yachts puts in use the advantages of faster hulls, giving a stuck to the water feel safe approach typical of a displacement hull but at the same time when necessary also sporting an agile handling similar to a planning design. The 41 Heritage EU further improves and consolidates the planning notion by offering a fast propulsion set up with the ZF Zeus aft looking dual propeller pods, and twin medium power Cummins QSB5.9 at 425hp each. Top speed is of 25 knots, not bad for an explorer cruiser with an all time cruise of 17 knots. Range always an important theme in an explorer cruiser is a shy for an explorer boat 276 nm at 17 knots, but a reassuring 743 nm at the most economic 7 knots speed. Grand Bank's 41 Heritage EU is a bit of a unique boat offering speeds close to those of a flybridge motor cruiser type boat, and at the same time having a slow medium cruising range similar to that of heavier full displacement explorer type yachts. That's not to say the 41 is not an explorer medium range cruiser, it is also this, but it also offers benefits of another way of going on the water while still being in its own unique explorer world. Closest competitors to the Grand Banks concept are all shaft powered and are the down under build Clipper 45 Cordova, US Mainship 45 Trawler, and the bit bigger Italian Estensi 480 Maine. Criteria was for Explorer Cruisers with twin medium range or single engine longer transatlantic set up, thirteen to fourteen metres of length, and an open Europe style aft main deck. With its traditional line and looks, the Grand Banks 41 Heritage EU pays big tribute to its name, hiding it's revolution in the engine room, propulsion and hull all this representing the brand in the past, present, and future. The 41 was launched in 2008 as the new entry level to the explorer cruiser Heritage line, breaking at the time new technical ground, thanks to the innovation presented by the pod drives. This also stepped up the 41 Heritage to make a revolution to the range, which only the future will tell if this is big as the 36 which marked the change to fiberglass construction at Grand Banks in 1973. This new propulsion set up give the 41 Heritage EU also a big efficiency advantage: that of good medium speeds with less powerful engines, and a better range when going slow. Thinking that pods started there life for use on ships in 1998 it is also surprising how this system is as today ignored on semi planning, displacement medium sized yachts! Apart from the pod drives, the 41 Heritage EU follows the famed Grand Banks selling points, that of superb attention to detail with a living aboard comfort in a luxury wooden finished interior. A successful theme proposed by the US Singapore builder since its inception in 1956, which I doubt will it ever consider to change. Design Team, Earl Alfaro hull, Toni Profitt interior. Picture Copyright Grand Banks. Data Grand Banks.